The price movements of an asset can be viewed in many different chart formats, such as candlesticks, open-high-low-close (OHLC), or Renko (among others). Charts can also be viewed based on a linear (arithmetic) or logarithmic scale. 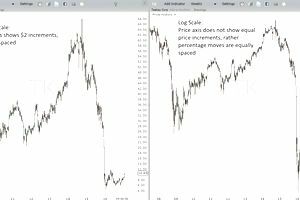 Most charting and trading platforms allow you to switch between seeing prices in linear or logarithmic scale. At first glance, they may look similar, but there are significant differences between these chart types. The difference between linear and logarithmic charts is how the y-axis (the price portion) of a chart is spaced. Candlestick and OHLC (and most other chart types) have time plotted along the bottom of the chart (x-axis) and the price is along the y-axis. On a linear chart, the price spacing is equal. The reference points along the y-axis ascend in equal increments with equal spacing between them. For example, a stock chart may show $1 (bottom) to $10 (top) along the y-axis, and each one dollar increment is equally spaced from each other. The chart is an equally spaced grid. Linear charts plot price points exactly as they are in dollar terms. If the price rises from $1 to $10, or $10 to $50, the grid spacing on the chart does not change. This varies from logarithmic, or log, charts. The y-axis of a log chart is scaled based on percentage moves. For example, if a stock jumps from $1 to $2, that is a 100% move, and assume it takes up four inches of chart space for that $1 (100%) move. If the stock jumps from $2 to $4 (a $2 move) the y-axis will compress so that the distance between $1 and $2, and $2 and $4, is the same (4 inches for each, in this case). This is because each move--from $1 to $2 and $2 to $4--is a 100% jump and therefore given equal weight/spacing on the chart. In other words, if a certain percentage move takes up X inches of chart space, each subsequent percentage move (of the same amount) will also take up X inches of chart space, regardless of how high/low the price gets. A linear chart does not do this. A price move from $3 to $4 covers the same distance as a move from $1 to $2. The dollar amount the price is moving is the same, but the move from $1 to $2 is a 100% gain, while the move from $3 to $4 is a 33.3% gain. The log chart reflects this percentage gain difference, while the linear chart does not. On a log chart, the move from $3 to $4 will look 1/3 the size of the move from $1 to $2, visually reflecting the difference in percentage gained. On the linear chart, all one dollar moves take up the same amount of visual space. Linear charts have a fixed distance between price levels, while log charts have fixed distances between percentage moves. Figure one shows a comparison between a linear and log chart, on the same stock over the same time period. Some charting software will use a linear scale by default, while other charting software will use a logarithmic scale by default. This setting can be altered within most charting platforms (check the help section for your charts if you can't find the setting). Either setting can be used, but the interpretation of the chart may be affected by the choice. Short-term trades will typically use linear charts because these traders are only concerned with how much (in dollar terms) the price actually moves. Also, in a single day or even or a period of weeks, a linear and log chart will look very similar since the percentage moves aren't big enough on the log chart to show a significant difference in scaling. Longer-term traders may wish to view both log and linear charts to gain a different perspective, especially when viewing charts spanning years or significant price differences. If you are a short-term trader, stick to linear charts for your analysis. Percentage moves aren't typically that large over a short period of time, so there is no reason to gain a different perspective from a log chart (it will look pretty much the same). Longer-term traders may benefit from looking at both log and linear charts. That way they see both the dollar moves, as well as how that scales in percentage terms. That is the difference between linear and log charts--the former is only concerned with price, while the latter looks at percentage moves and scales the price-axis accordingly.